Are All Backup Products Equal or the Same? No, they are not. Some are more equal than others. This article came about due to this common question we get asked from customers. “What backup product do I use”. The aim is to provide information to think about to assist you in making that decision. Of course, we can assist if you contact us. In short, do your homework and look for features that suit YOU and not what the vendor tells you. There are currently hundreds of built-in tools to an operating system and even more third-party backup products as well. So, do your homework. Also refer to our other post titled “How to Avoid Data Loss and Achieve a Greater Recovery Point Objective (RPO)”. Is the list complete? Of course not. It will change regularly as existing tools and products are upgraded with new features and new products are released. How do you evaluate a backup tool or product? The key with evaluating any product is to know your requirements first and then match those requirements to a set of features. Understand your data and backup requirements first. Do NOT get or purchase a product and attempt to ‘force it’ into working for you just because it had an extensive feature set or “looked good”. Many people tend to put a lot of emphasis on the back up features of a product. Conversely, I put a great deal of weight behind the recovery features. I want to see real robust functionality and as much flexibility as possible at the time of need. And I can assure you that when the time to recover data arises, you want to be able to restore data quickly and smoothly without any delays and complexity. I believe that the time a backup product really shines is when you need to recover from it. We cannot tell you what features to look for and what to avoid. Ultimately, you need to understand your data and backup requirements first. 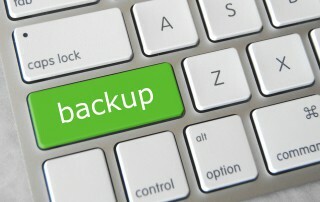 By the way, these backup design principles do not just apply to computer systems. They apply to any electronic device that stores valuable data. This includes network devices such as routers and firewalls, storage devices such as NAS, mobility devices such as laptops, smart phones, tablets, etc. It applies to any device that you store data that you consider to be valuable to you or your business. It is interesting how many people completely ignore backing up their mobility devices such as laptops and smart phones. In many situations your smart phone can hold your daily operation whether personal or business. The question is, how do you backup your smart phone? Sounds like a discussion for another article. Like with all products we install, we perform UATs. This is where we put to the product or solution to the real customer experience tests. The last point may seem simple but we recently spoke to a client where he religiously backed his servers up and tested that the backups had valid data on them. We then asked if he ever tested simulating a disaster and restoring those backups to another physical server (ie in case of fire and total destruction). His reply was odd as he said that his backup software could only restore to the server the backup came from (it was due to licensing reasons). Well that’s not ideal. In fact, I’d be looking for another backup product. How odd that you can happily backup one server and in case of disaster, restore to just the same server. What will he do when a real disaster occurs and he needs to restore the data to new servers to run his enterprise from a new facility. The recovery procedure involves requesting licenses from the vendor. What does your backup product require?